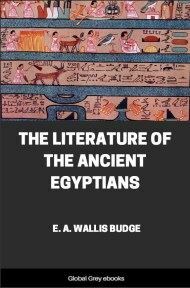 This book has text and analysis of a key Egyptian ritual which was performed when preparing the corpse of a pharaoh for mummification. This is known as the "Book of the Opening of the Mouth". The ritual consisted of offering a long sequence of foodstuffs, beverages, cosmetics and other consumables, along with a litany recited by the priests. This text was also painted on the walls of the royal tomb. THE tombs, temples, and religious literature of all periods of the history of Egypt proclaim with no uncertain voice that the ancient Egyptians believed in the resurrection of the dead, and that they possessed an innate conviction that the souls of the blessed renewed their existence in the world beyond the grave under circumstances and conditions which gave them happiness and prevented them from dying a second time. 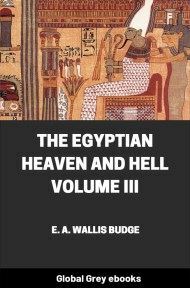 The consistent, persistent, ineradicable and unalterable belief in immortality is the chief fundamental of the Egyptian Religion, and the attainment of everlasting life was the end to which every religious ceremony was performed, and every funerary text written. 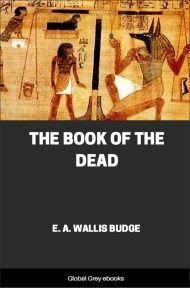 Now, although in the Dynastic Period the Egyptians believed that the dead rose again because Osiris rose from the dead, and that it was indeed he "who made mortals to be born again," and who bestowed upon the "re-born" new life, with new powers, spiritual, mental, and material, they spared no pains in performing the works which they thought would help themselves and their dead to put on immortality and to arrive in the dominions of him who was the "king of eternity and the lord of everlastingness." Every tradition which existed concerning the ceremonies that were performed on behalf of the dead Osiris by Horus and his "sons" and "followers" at some period, which even so far back as the time, of the IVth Dynasty, or about B.C. 3800, was extremely remote, was carefully preserved and faithfully imitated under succeeding dynasties, and for long after Christianity was established in the northern part of the Nile Valley, and Egypt was filled with Christian monks. The formulae which were declared to have been recited during the performance of such ceremonies were written down and copied for scores of generations, and every pious, well-to-do Egyptian made arrangements that what had been done and said on behalf of Osiris should be done and said for him outside or inside his tomb after his death. No ceremony, however trivial, was considered unimportant, and no form of words was thought useless. New ceremonies and words might be added, for it was held possible that they might become a means of salvation, but nothing might be omitted intentionally. 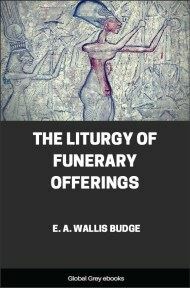 The natural result of this religious conservatism was that as centuries rolled on the significance of several funerary ceremonies was forgotten, and the meanings of many liturgical phrases were understood with less and less exactness, until at length they became mere collections of words, which conveyed little to the minds of those who heard them. Now the oldest religious ceremonies and formulae known to us were invented in connection with the presentation of offerings to the dead. In the Pre-dynastic Period men buried offerings of food, unguents, &c., with their dead, believing that, in some mysterious way, such material gifts would assist their relatives and friends to maintain their existence in the Other World. When this custom first arose cannot be said, but it was certainly general in the late Neolithic Period, and it continued to flourish for several thousands of years. Indeed it is probable that modified forms of it exist at the present day among the pagan, Christian, and Muhammadan inhabitants of the Nile Valley. We cannot tell now what ideas existed in the minds of those who gave offerings to the dead as to the way in which such gifts benefited the dead. There is little doubt that at first they believed that the life which was led by the departed in the Other World closely resembled life in this world, and it may be reasonably assumed that they thought that the food which they placed in graves with the dead was actually consumed. They must have known that their funerary offerings would last in the ordinary way but a short time, and it seems as if it was only intended to supply the needs of the departed on their journey to the place of departed spirits. On the other hand, the fact that personal ornaments were buried with the food, and flint weapons of war and the chase, suggests that the living intended them to be used by the dead for an indefinitely long period. 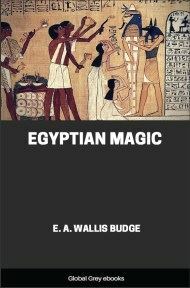 The primitive Egyptians appear to have thought that inanimate things possessed spirits like human beings, and if this be so it is probable that they also believed that the spirits of human beings in the Other World fed upon the spirits of the offerings made to them in this world by the living. This being so it would be necessary to renew the supply of offerings of food at regular intervals, so that the spirits of the dead might be prevented from suffering from hunger and thirst, and from dying a second time through exhaustion. There was also another side to the question of an important character. The souls of the dead who lacked food would, it was thought, be driven by hunger to the villages wherein they dwelt during their life, and would eat up such food as they found there, or, in the event of finding nothing suitable for their wants, would cause sickness, disease, and trouble. To avoid such a calamity it was necessary to make offerings at their tombs, and to propitiate them with suitable gifts at regular intervals. Thus the giving of sepulchral offerings profited both the dead arid the living. 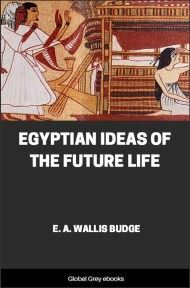 Among the Egyptians of the Dynastic Period the presentation of offerings to the dead was regarded as one of the chief duties in life of the religious man, and it will here be well to illustrate their views on the subject by references to texts of several periods. In the second section of the great text in the Pyramid of Unas the "Chiefs" are called upon to give to king Unas in heaven the loaves of bread, cakes, and drink-offerings which he had offered to them upon earth, and Ra himself orders those beings who preside over the products of the year to give Unas wheat, barley, bread, and beer from the supplies which they had collected "For, for Unas to be hungry and not to eat, and to be thirsty and not to drink, is an abomination to him" (l. 195). 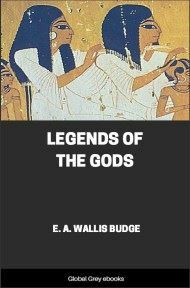 In the text of king Teta the writer addresses hunger and adjures it not to approach Teta, but to depart to the god Nu, for Teta suffers not hunger like the god Shu, nor thirst like the goddess Tefnut, because the hunger which is in the belly of Teta, and the thirst which is on his lips, are destroyed by the four children of Horus, Hap, Tuamutef, Qebhsennuf, and Amset.